What Causes a Lump on Shin? The front part of your lower leg is called the tibia and is also your shin bone. This is a very strong bone, holding almost your entire body weight up, and forming the knee joint. If you hit your shin bone, you can get a goose egg, or painful bump on the bone. There is very little subcutaneous fat on your shin bone, which causes a bump to it to be more painful and prone to damage. It can be a result of hematoma, this is the blood that is leaked from an injury and gets trapped under the skin. Any person can easily get a goose egg on their shin. It is more common in teenagers and people playing contact sports. Those who have blood disorders like hemophilia can be more susceptible to having goose eggs on the shin, even with just a bump. If you get an infection deep in the skin layers, generally from the skin’s bacteria, you can get an abscess. There are infections caused by staph as well. If you have an abscess, a walk-in clinic can treat with an incision and draining. You may get antibiotics prescribed. There can be surgery involved to rid yourself of the entire abscess when the inflammation is gone. Don’t drain the abscess on your own. 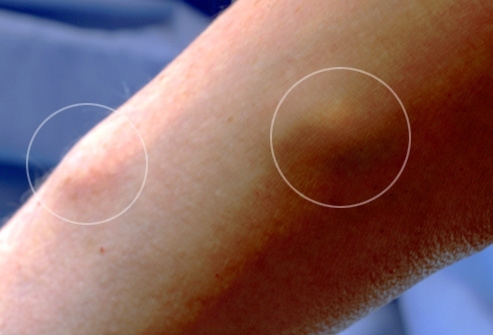 This can be fairly common and will show as a painful lump that is pink or red. It can leak milky fluid. You won’t see a fever, but you should get it taken care of at the nearest urgent center as soon as you can. This is infection of the deeper layer of skin, typically from bacteria found on the body. These are more commonly caused by staph recently. If it spreads, urgent treatment will be needed. Go to the ER if you think the infection seems to be spreading. It’s likely you’ll get antibiotics. Surgery can be required to get rid of the entire abscess and you shouldn’t drain it yourself. This is a rarer occurrence, and some common symptoms are fever, fatigue and pain along with swelling and redness. You should go to the ER right away. There can be mole growths on the skin which causing a lump on shin. These are when the skin pigment cells, known as melanocytes, grow in clusters. If you have moles, you can tell your doctor about it, so they will help keep track of changes. You may need to consider treatment if a new mole is found. These are more uncommon causes of a lump on your shin. Your symptoms will be a bump or black or brown spot. They aren’t something you tend to need to see the doctor for. This is a fungal skin infection that can be quite common. The rash is often called ringworm because of the red, itchy rings that form o the skin. It can be treated with antifungal ointment that you get over-the-counter such as Lamisil. Apply directly to the rash and the skin nearby. Keep the area as clean and dry as possible. Some of your more common symptoms include skin changes, dry skin, an itchy rash and more. You won’t see fever, groin or scrotal itch, hand skin changes, or genital or groin skin changes. This can be handled with the pharmacy or over-the-counter medications. It is true that pimples, or acne can also be the cause of a lump on shin. It can happen with hair follicles get clogged with dead skin cells or oil. There are some cases where patients visit a dermatologist because of their acne, but commonly it can be treated at home with OTC medicine and good hygiene. Acne is common and noted by small, marble-sized lumps on the skin. These are easy to treat at home. When the skin is inflamed, it is called dermatitis. This can be caused by a number of things from infections, to allergies to autoimmune issues. NOS or normal variation of dermatitis means there aren’t any other causes of the rash and it’s very common. It is treatable at home, and the rash will often go away with anti-histamines and topical corticosteroid creams. It is common and comes with an itchy, painful rash. If you get an epidermoid cyst, you will have a closed sac under the skin that has oily, or cheese-like material in it. This can be caused by surgery or trauma. This condition won’t need treatment as it is usually benign, but if a lesion happens your doctor should be consulted. Your doctor can cut out the cyst if you want it removed. It is a common condition with a palpable mass as a symptom. It tends to get better on its own. This is a noncancerous growth with fatty tissues. It can develop in nearly any body organ, but most often found in the subcutaneous layer just under the skin. You won’t need treatment from your doctor unless you want it burned, cut or frozen off. This is less common and appears as a mass that is skin colored. You should see your doctor, but it is not urgent. If you have a lump on your shin, you may have a tibial tumor. This is can be a painless or painful lump, depending on the tumor type and whether it is impinging on nearby structures. A tibial tumor that is growing can cause nerve compression, called bursitis, or painful inflammation of the sac around the body joints that is fluid-filled. The sacs are there to reduce friction and provide cushioning but can’t do so when inflamed. The mass can be either soft or firm, mobile or immobile, dependent on the tumor type. If the tibial tumor is cancerous, the lower leg may swell up also. Rest is one of the best ways to help keep the swelling down. You should stop any extra activity and keep your leg up. Apply ice to the knot. Place a few pieces in a cloth and hold over the injury. This will help reduce blood flow by causing the blood to clot quickly. Apply ice for ten minutes every three to four hours for the first couple days for the best results. Compression can help. Wrap a compression bandage around the affected spot. This can help to stop bleeding and reduce swelling. Elevate the leg. Elevation can allow the blood to flow toward the heart easier. Anti-inflammatory drugs or pain killers may be necessary to reduce swelling and alleviate pain. These should only be taken with the help of your doctor. Sometimes antibiotics are prescribed as a precaution. This is especially true if the skin has been broken as well. Both Ruta and Arnica are homeopathic medicines that can help relieve swelling quickly. Turmeric is another home remedy that can reduce pain and swelling. Place a pinch in your tea or in warm milk and drink twice daily. Make sure to get plenty of fruits and vegetables in your diet with vitamin C. This can help with the healing process. Server responsed at: 04/25/2019 2:28 p.m.